Designed from the ground up to meet the data storage needs of today’s media creators and demanding professionals, the 5D builds on Drobo’s fully automated functionality with blazing-fast performance in a compact design. Leveraging cutting-edge Thunderbolt and USB 3.0 connectivity, along with the innovative use of solid state drives (SSDs) – Drobo 5D is the highest-performing personal storage array on the planet. 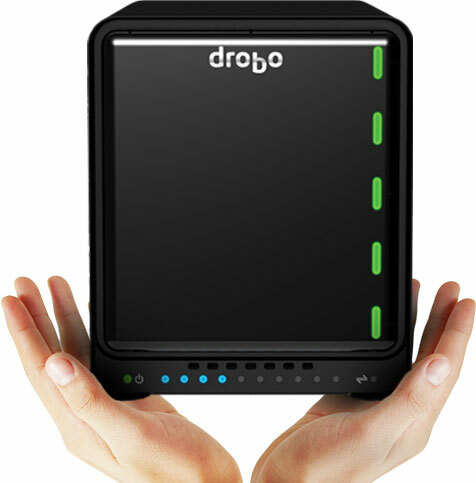 Not only is it fast, Drobo 5D is easy-to-use, expandable, flexible, and guaranteed safe. Built on our award-winning BeyondRAID technology, the Drobo 5D protects your data without any intervention – even in the event of multiple drive failures. You can even switch from single to dual disk redundancy with a single click, ensuring enterprise-level dual parity data protection when required. Drobo’s with BeyondRAID are also self-healing and have virtual hot-spares. If a drive happens to fail, Drobo will automatically re-layout the data to return to a protected state without disruption. If you’re running low on space, the lights on the front of the Drobo 5D tell you exactly what to do. The innovative, user-friendly industrial design allows you to add or hot-swap larger capacity drives, without tools, on the fly, for storage expansion with zero downtime. Expand your capacity without missing a beat while safely storing and backing up all personal data with ease and peace of mind. It’s that simple! Usually reserved for larger enterprise-class storage solutions, the Drobo 5D gives you the option to implement Hot Data Caching through the Drobo Accelerator Bay. This feature intelligently uses high-performance flash to accelerate performance, allowing the fastest possible access to your data. To keep capacity of your Drobo 5D at a maximum, the Drobo Accelerator Bay accepts an industry-standard mSATA SSD, leaving all five 3.5” drives bays available for high-capacity HDDs. If getting the fastest performance possible is your thing, you can also load up every drive bay with SSDs. Drobo 5D gives you the flexibility to choose! Drobo Mini and the Drobo 5D are the only storage solutions that offer Thunderbolt and USB 3.0 connectivity in the same box. Multiple thunderbolt ports allow you to simultaneously connect up to six Thunderbolt devices at once. With bi-directional 10 Gbps performance, Thunderbolt technology allows all devices in the chain to achieve maximum throughput. This latest generation of USB 3.0 offers 5Gbps high-performance connectivity and is backward compatible with any computer running qualified versions of Mac OS X or Windows. The Drobo 5D doesn’t just protect from drive failures, it also includes a battery backup system that protects all data in memory or cache. That’s right, Enterprise grade data protection for you on your Drobo 5D! If power spontaneously goes away, the Drobo stays alive long enough for the data to be written to disk, ensuring your important information is always safe. The onboard battery recharges itself and is designed to last for the life of the product. One (1) year warranty in the US or outside the EU or two (2) year warranty in the EU.